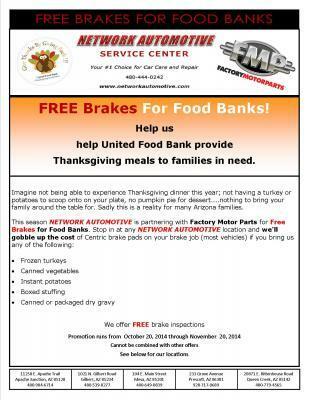 Network Automotive Service Center is promoting Free Brakes for Food Banks! If you bring in any (or all) food items listed in the flyer/image we'll pay the cost of the brake pads (most vehicles) if your vehicle is in need of a brake job! Stop in at any one of our full service auto repair locations for a free brake inspection.